A space arcade game from the endless runner genre, developed by Kool2Play. At first sight, Hyperide resembles classic space shooters that were once popular in the arcades. We control a small space ship that keeps flying upwards through levels filled with enemies and dangers. Hyperide is an AND and iOS release of a cosmic arcade game using a free model with micropayments. The game was developed and released by the Warsaw-based Kool2Play studio. 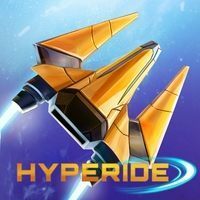 Developed for the mobile AND and iOS systems, Hyperide is devoid of any storyline and focuses on pure gameplay. At first glance, the game looks like an old-school space shooter, pulled directly from the arcade machines salons. We steer a small ship, which flies up the screen through the dangerous boards. In fact, the gameplay is different in one key aspect - our unit is unarmed. In this way, the whole game is about avoiding collisions with screen littering objects. The graphics were made in nice 3D, but the gameplay mechanisms are fully two-dimensional and are based on a simple touch interface, allowing you to efficiently control the flight path of the ship by touching the left or right side of the screen. There are two modes to choose from. The first one requires fulfilling specific tasks and breaking through the boards with a specific beginning and end. The second is the infinite mode, where threats are generated randomly. Here the star trail never ends, so the gameplay lasts until the ship is destroyed. In this way we are motivated by the willingness to beat our own records and those developed by the rest of the community. The gameplay is enriched by the ability to unlock many useful items and better and better ships. The authors have not forgotten about their achievements either. Moreover, during the flight from time to time we may come across astronauts drifting in the emptiness of space. Saving them is dangerous, but the game reliably rewards taking this risk.